This card uses the sketch from Fusion Card Challenge the circles challenge from Stampin' Royalty and the colors from Color Throwdown. This will be going to my father and as always, I really feel the pressure when making cards for either of my parents, because I want to give them something special. I'm happy with how this came out. I sponged various blue inks onto a panel of white cardstock then flicked water onto the panel. Once that was dry I white-embossed some stars and cut it out with a pierced circle die. I kept the bottom part of the circle lighter than the top. I did a similar thing with the rectangular panel, using yellow distress inks and the water flicking. With a piece of leftover blue, I embossed the word "light" using Crushed Curry EP and die-cut it with a flag die. The first part of the sentiment is white embossed onto a piece of slate cardstock. 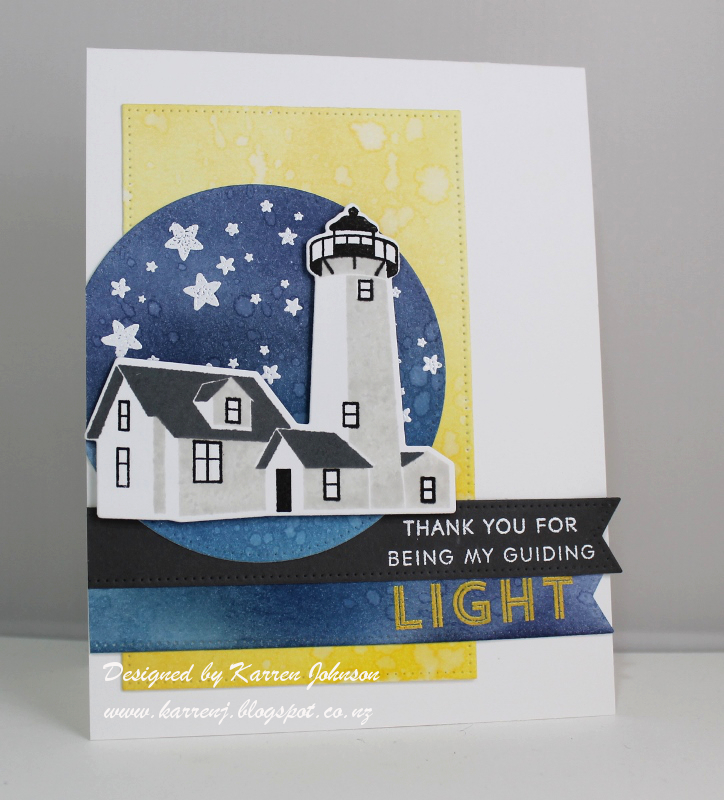 The lighthouse was stamped using Fog, Slate and Onyx Black inks and I really like the neutral tones in front of the vibrant color. Unfortunately when I was sticking the two banners together, the bottom one must have slipped slightly and now my sentiment is crooked! I hate when that happens, but I didn't have any more leftover inked cardstock, so I had to leave it as it is. 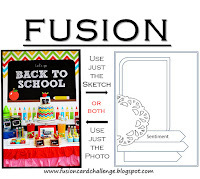 Edited to Add: This card got a shout out at Stampin' Royalty and Fusion Card Challenge. Wow; just beautiful. Love your "water flicking", and use of colour, on this card Karren - it's very special. This is a beautiful scene!! Great job with the challenge. Wow, Karren! 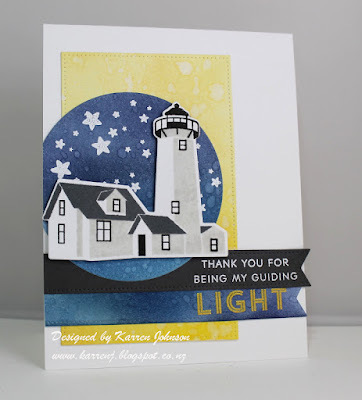 This card is so beautiful and a wonderful use of the sketch! Love it! These colors are perfect for a masculine card and I'm sure your father will love this special card! It's always great to see your talented creations in the throwdown gallery! Thanks for playing along with us again! 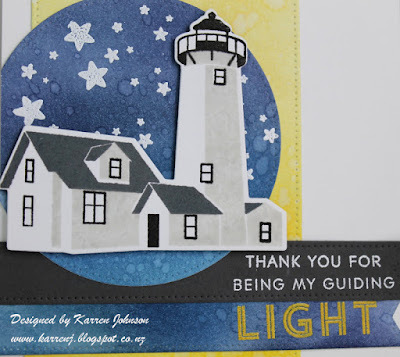 Karren, this is an AWESOME card, I LOVE anything nautical, and this is so perfection for the sketch!! Thanks so MUCH for joining us at FUSION!! Stunning Karren! Love the sentiment!! Thanks so much for playing along with us at FUSION. Your father will love it!! Great use of the colors!! This for joining us at CTD! Fun use of the sketch. I just had to go and look up that light house stamp. That looks so gorgeous and you know I love the grey shades so much. And by the way, you nailed both challenges!! Just GORGEOUS Karren, love your starry night against the lighthouse! So glad you joined in the fun @ FUSION, hope to see you again soon! this is gorgeous, love how you put this together! Thanks for joining us at Fusion.